The European – ACP Women’s Rapid and Blitz Championship 2017 was a great success as a result of yet another instance of fruitful cooperation of the ACP and the ECU. It had a record number of 91 participants. The rapid section was won by Anna Muzychuk, an ACP Premium, ahead of Kateryna Lagno and Aleksandra Goryachkina, another ACP Premium. The winner scored 9/11, half a point ahead of second-placed Lagno and a full point ahead of third-placed Goryachkina. The blitz was won by our ACP Premium Alexandra Kosteniuk on 10.5/13, half a point ahead of Kateryna Lagno and a full point ahead of another ACP Premium, Valentina Gunina. Both events had live commentary and there were many guests visiting the live transmission. The live broadcasts were followed by thousands of people all over the world. 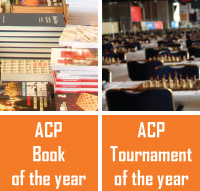 The ACP is pleased to have co-organised such a prestigious event and we hope to do even better next year.